Take the total length of the shutter and divide it by 12. In this case 88 inches/12 inches=7.33 square feet. From there, take the price they are asking for the shutter and divide it by the square foot to get the price per square foot. $49.00/7.33=$6.68 per square foot! We charge only $5.89 per square foot! 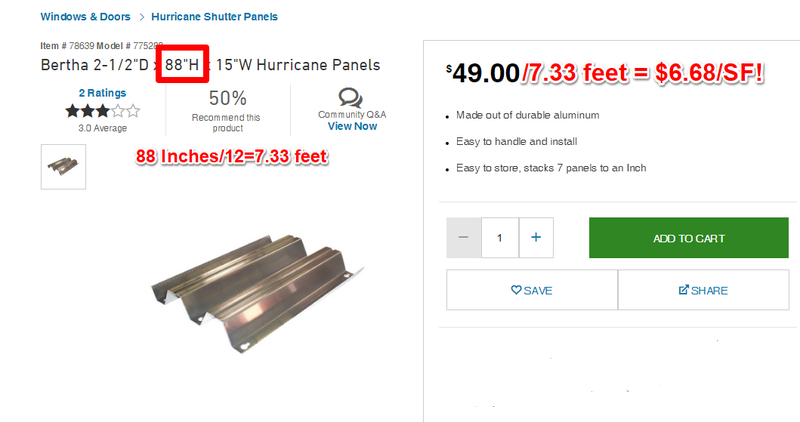 Our price for that same shutter is only $43.19! Multiply the savings per 30 to 60 shutters and we save you hundreds to thousands of dollars!! And how will you handle this with our big box competitors? When you buy from www.hurricaneshutterswholesale.com you don't even have to leave your house to buy and we can ship it straight to your front door!